A star-studded field laced with world champions will gather in the sleepy Southern Drakensberg town of Underberg this weekend for the 26th edition of the N3TC Drak Challenge canoe marathon in partnership with FNB, to take on an uMzimkhulu River that is running low, thanks to the ‘green drought’ gripping the region. Organisers are preparing to run the event on low-water rules and over a shortened course, as they did in similar circumstances last year, starting the race at Sinister Pool at the Swart Road bridge, overnighting at Callaway Bridge before finishing at the traditional finish at Early Mist Farm. “It has been vexing to see the regular afternoon thundershowers producing negligible impact on the level of the river,” said race committee head Lloyd Riggien. “The farmers will tell you about the ‘green drought’ and just how low the water table is, and the build-up to this year’s race reflects that. “We are confident that the way the paddlers embraced the low water conditions last year and really enjoyed the outing in the uMzimkhulu valley will happen again,” he said. The event, which serves as the first leg of the International Canoe Federation World Series, will also double as the SA and KZN K1 River Championships, adding further weight to the already prestigious title. Predictably the event has attracted a top-class elite field, spearheaded by defending champion Andy Birkett and his world champion partner Hank McGregor. The Euro Steel team mates have been the chief protagonists at the N3TC Drak Challenge for the last decade, with McGregor having won three on the trot, but Birkett has claimed the last five editions of the race. That allows him to share the status as the race’s most successful male paddler with Drak icon Ant Stott, but one short of the all-time record holder and women’s record holder Abby Solms, who has seven wins to her credit. McGregor has made no bones about his desire to win the title this year, and has fired a series of warning shots over Birkett’s bows, notifying that he is happy to surrender the Dusi title on the understanding that the Drak title is his in 2019. With a low and technical river likely, McGregor will be at pains to spend hours recceing the river to learn the deepest channels and rocky hazards before the two day, 40km encounter. Birkett, after winning the 50 Miler, has been ensconced in Underberg tripping the river as well, setting the scene for a titanic showdown between the two friends. That tussle will be complicated by the entry for Spanish pocket-rocket Kiko Vega, who has been getting to grip with the challenges of the uMzimkhulu River with the help of local tutors, as well as the on-form EuroSteel/Varsity College local talent Stew Little, and a slew of talented paddlers eager to hunt down a spot on their respective podiums. The women’s race promises to match the men’s race for thrills. Defending champ Jenna Ward has returned to defend her title as she builds up to a full season of racing in 2019. 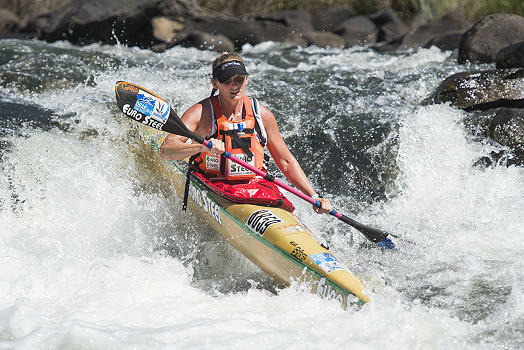 She will come up against a determined Euro Steel team mate Brigitte Hartley, who has somehow never managed to close out a challenge for the Drak title, and is quietly confident of her abilities on the low river. Young Euro Steel/Varsity College star Christie Mackenzie, who shook the river marathoning community with her FNB Dusi second place before tasting podium success at the World Marathon Champs is also in great form, which she evidenced with her win at the recent FastDrak ultra marathon, held, significantly, in equally low water conditions. The organisers will make a provisional call on the race format on Friday morning, remaining flexible to accommodate the chance of a Berg thunderstorm in the river’s catchment area bumping up the river levels.